Participation, Community, and Public Policy in a Virginia Suburb challenges conventional wisdom about the nature of modern American communities. Through the story of Northern Virginia’s Pimmit Hills, she finds many more types of activities shape a community, than just those few typically tracked by social scientists, such as volunteering. Communities are the sum of a wide variety of participation—positive, negative, formal, informal, direct, and indirect. 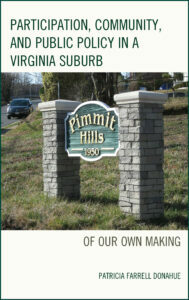 Pimmit Hills’s rich history will be familiar to those who grew up in middle-class suburbs, while its proximity to Washington, D.C. makes its story unique. Patricia Farrell Donahue received her M.A. in public policy from Georgetown University and Ph.D. in public policy from George Mason University. She is the 2014 Recipient of Mason’s Robert L. Fisher Award for Best Dissertation and Academic Achievement. She works as a senior policy analyst in the federal government, studying community and economic development, health, banking, defense, housing and other topics. She also serves as a Policy Fellow at Mason’s Schar School of Policy and Government. The Mason Author Series is co-sponsored by the University Bookstore. 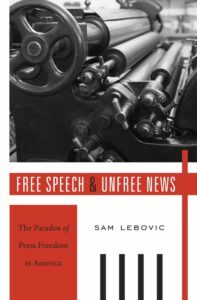 press freedom as it has existed in theory, law, and practice, Sam Lebovic shows that, on its own, the right of free speech has been insufficient to guarantee a free press. Winner of the prestigious 2017 Ellis W. Hawley Prize, Organization of American Historians. Free Speech and Unfree News compels us to reexamine assumptions about what freedom of the press means in a democratic society. Sam Lebovic is Assistant Professor of History at George Mason University, where he directs the Ph.D. program in History and serves as associate editor of the Journal of Social History. His research focuses on the history of American politics, culture, and media, and his essays and articles have been widely published. 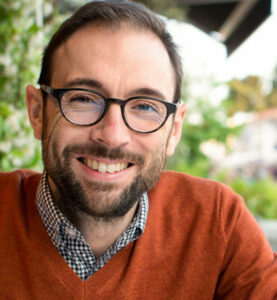 Lebovic teaches a wide range of subjects in modern American and global history, and he is currently researching the mid-century history of cultural globalization. At Mason, we want to make your courses accessible to all students. One way to do that is to reduce the costs of the textbooks and other educational materials you use—and University Libraries can help. We offer support for reducing the cost of textbooks and for making library-licensed e-content available to your students. 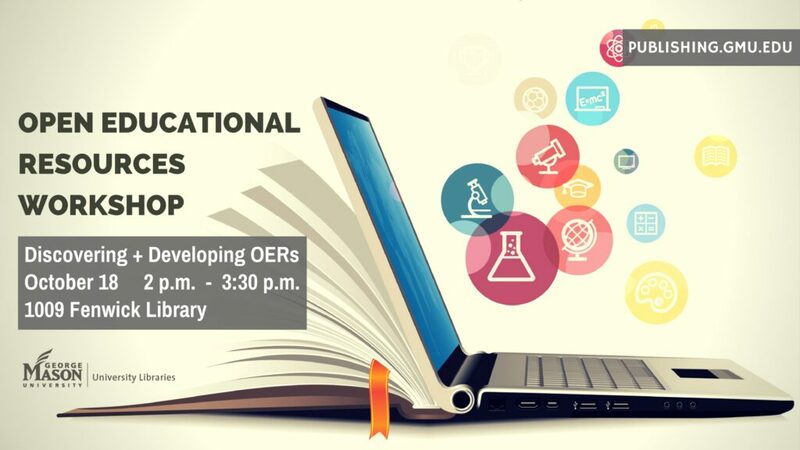 We’re also ready to help you discover, use or even develop and publish your own open educational resources. In conjunction with Deep Web Technologies, University Libraries has developed a search engine that simultaneously queries a number of open educational resource sites. In addition to well-known OER repositories like OpenStax or Merlot II, our Metafinder also searches HathiTrust, DPLA, Internet Archive and other sites where valuable open educational materials may be found. We’re still adding search targets but today our OER Metafinder searches sixteen sites in real time, returning the top 250 or so hits from each site–in seconds! Additional matches continue to trickle in as you begin examining your results. The high costs of textbooks have led universities including Mason to advance OER adoption to reduce the cost of instruction for students, improve teaching and learning outcomes, and enable better opportunities for students through open access to quality educational resources. web2rights Creative Commons License Compatibility Wizard. This article originally appeared in the May 2017 issue of Choice magazine. Note: Choice magazine’s annual University Press Forum offers the perspectives of University Press directors on a variety of topics. This year’s Forum—the 13th in the series—addresses the topic of Innovation at the University Press. Essays from eight University Press directors are included in this year’s Forum, including Bruce Austin, RIT Press; Courtney Burkholder, Texas Tech University Press; Faye Chadwell, Oregon State University Press; Steve Cohn, Duke University Press; Linda Manning, The University of Alabama Press; Gianna Mosser, Liz Hamilton, and Jane Bunker at Northwestern University Press; Mary Rose Muccie, Temple University Press; and yours truly. As with many, if not most, things these days, perception does not perfectly correlate with reality. Despite the fact scholarly publishing is undergoing a period of change, turmoil, and reinvention, relatively few presses are closing. Many academic institutions continue to see the value in supporting a press and most, if not all, presses do a fair job of breaking even, coming close to breakeven, or generating a modest surplus. Press closures, or attempted press closures, however, receive an exceptional amount of press coverage, social media activity, and activist response from scholars, publishers, and others involved in the scholarly ecosystem. The establishment of a new press, on the other hand, frequently goes unnoticed, for reasons that are understandable—it usually takes a while to make any kind of impact and gain attention. Although precise numbers are hard to come by, two areas that have grown over the past decade in terms of new presses appear to be academic library publishing and scholarly publishers in developing countries. 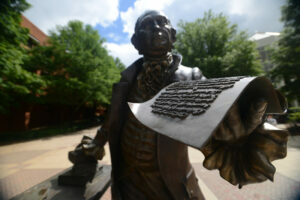 My institution, George Mason University, provides an example. The University Libraries had been involved in various publishing services for several years, including dissertations and thesis services, scholarly communications, open access journals, and an institutional repository. There had also been a separate effort to establish a university press in the mid-1980s, through a partnership with the University Press of America, formally an imprint of Rowman & Littlefield. Subsequently, an initiative was started in 2007, under the aegis of Mason’s College of Humanities and Social Science, which published a handful of regional titles. In 2014, the University Libraries established a formal publishing program incorporating both library publishing services, under the imprint of Mason Publishing, and the George Mason University Press, to support the creation, dissemination, and curation of scholarly, creative, and educational works. Our approach to this new publishing venture is as a start-up. Even though we were not exactly starting from scratch, there was no “legacy” operation to be concerned with (nor, unfortunately, a vibrant backlist to fund publishing efforts). The framework of a start-up provides an opportunity to define (or redefine) the priorities, strategies, and tactics to pursue. What is our organization’s (library and university) vision/mission? What are the interests, concerns, and expectations of our stakeholders (administration, staff, partners, funders, audience, etc.)? How important is the pursuit of revenue/profit versus social good? What opportunities exist for growth and innovation? How can we add value and what contribution(s) do we want to make to the world? What is the role and makeup of the advisory or editorial board? What is the role of or focus on open access versus commercial sales? What kind of books do we want to publish? What kind of books do we not want to publish? What other products will add value to our organization? An important first step was to align our strategic priorities with those of George Mason University. This involved explicitly connecting our specific objectives and tactics with those of Mason’s 2014–2024 Strategic Plan, with the stated priorities and concerns of the University’s Provost, and with the University Libraries’ strategic plan. A few examples that have informed the objectives of our press include Mason’s strategic focus on innovative learning, access, and diversity; creating learning partnerships that emphasize innovation and collaboration; contributing to the cultural vitality of our community through regional partnerships; engaging students in research; supporting excellence in teaching and scholarship; focusing on multidisciplinary research; and elevating research of consequence. Some of the ways these strategic goals translate into our publishing priorities include increasing the number of student and faculty led journals, particularly those focused on multidisciplinary research; providing increased training and editorial services to these journals; and leveraging our journals platform (Open Journals Systems) for conference proceedings and course use. For example, we approached Mason’s Center for Teaching and Faculty Excellence, proposing a partnership to publish abstracts, presentations, and papers for the annual Innovations in Teaching and Learning Conference, none of which had previously been archived. We are working with an English Composition professor to utilize OJS for peer review of student work in her course, an application that is generating interest among other faculty. We have also reached out to the larger scholarly community by helping to host and publish the papers of the Open Scholarship Initiative conference, a global collaborative effort between all major stakeholders in scholarly publishing to improve the future of how research information gets published, shared, and accessed. We sought to increase partnerships for faculty collaboration and opportunities for publishing student research by partnering with the Provost Office and Mason Online, Mason’s Office of Digital Learning, to promote the development and publishing of open educational resources (OERs) on campus. Our pilot project is focused on innovative course redesign that reconsiders the materials currently used with the intent purpose to integrate digital materials, with the aim of reducing the cost of instruction for students, improving teaching and learning outcomes, and increasing economic opportunities through open access to quality educational resources. While not a revenue opportunity, this effort adds value to the university by publishing faculty workbooks, open textbooks, and other publications that can be used as OERs both at Mason and beyond. And yes, we are looking forward to publishing a few scholarly books this fall that will make meaningful contributions to their fields (and, I hope, begin to build a backlist). Another important goal of our press, and we are certainly not alone in this, is to consider and start planning digital opportunities from the very genesis of a new project—not as an afterthought. Meanwhile, we need to continue to seek additional sources of funding for Press projects—subventions, grants, donors, crowdsourcing—and develop a revenue stream that sustains a growing Press publishing program. Longer term, we plan to implement a rich media journals publishing platform (i.e., Vega, in development at the University of West Virginia) that will support digital research and publications that include multimedia, data, and interactive aspects. Digital humanities are an established strength at Mason, and we aspire to support publication of this innovative research in its diverse forms. This approach underscores the importance of partnerships with other departments in the libraries and centers in the university. These include the Roy Rosenzweig Center for History and New Media, innovative faculty in the English and Rhetoric department, faculty in game design, and others. Our staff is contributing to the development of a new digital scholarship center and a new scholarly production lab within the library. Several principles help drive innovation and creativity, whether in a start-up or established organization. These include fostering an attitude of openness, of seeking diversity, of being open to criticism and not being afraid to make mistakes, looking for ideas everywhere, identifying hidden talents among staff, and instilling a drive to keep growing and learning. As important as trying new ideas is to jettison the ones that are not working or are no longer adding value to the organization. It’s also important to ask yourself frequently, “What kind of leader am I? What kind of leader do I want to become?” I like to use the phrase “experiment with intent”—meaning it’s great to experiment and try new things, but have a reason for it, such as what you can learn from the experience, even if the results don’t turn out as well as you hope. Assign important projects to staff, establish stretch goals, deliver feedback that is relevant, review the results, debrief staff, and articulate the business or social implications. For General Michael Hayden, playing to the edge means playing so close to the line that you get chalk dust on your cleats. Otherwise, by playing back, you may protect yourself, but you will be less successful in protecting America. 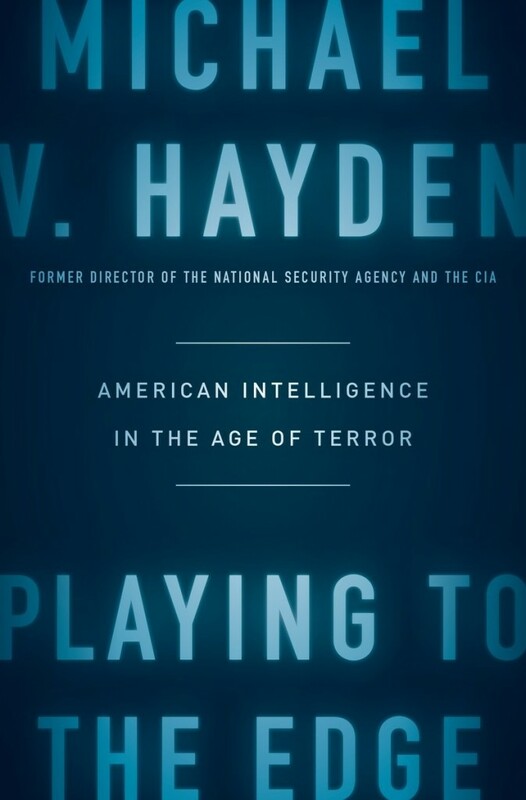 “Play to the edge” was Hayden’s guiding principle when he ran the National Security Agency, and it remained so when he ran the CIA. In his view, many shortsighted and uninformed people are quick to criticize, and this book will give them much to chew on but little easy comfort; it is an unapologetic insider’s look told from the perspective of the people who faced awesome responsibilities head on, in the moment. 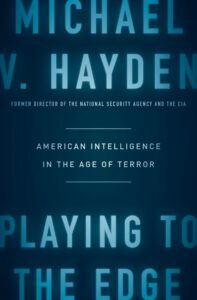 How did American intelligence respond to terrorism, a major war and the most sweeping technological revolution in the last 500 years? What was the NSA before 9/11 and how did it change in its aftermath? Why did the NSA begin the controversial terrorist surveillance program that included the acquisition of domestic phone records? What else was set in motion during this period that formed the backdrop for the infamous Snowden revelations in 2013? General and Distinguished Visiting Professor Michael Hayden is a retired four-star general who served as director of the Central Intelligence Agency and the National Security Agency — the only person to helm both agencies— during a time of heinous new threats and wrenching change. 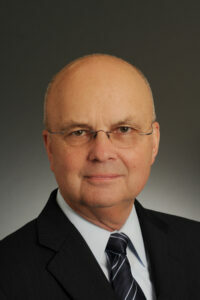 In addition to leading CIA and NSA, General Hayden was the country’s first principal deputy director of national intelligence and the highest-ranking military intelligence officer in the country. He also served as commander of the Air Intelligence Agency and Director of the Joint Command and Control Warfare Center and served in senior staff positions at the Pentagon, at U.S. European Command, at the National Security Council, and the U.S. Embassy in Bulgaria. He was also the deputy chief of staff for the United Nations Command and U.S. Forces in South Korea. He is currently a principal at the Chertoff Group and a distinguished visiting professor at the George Mason University Schar School of Policy and Government. The Mason Author Series is sponsored by the University Bookstore. During the Great Depression, the American South was not merely “the nation’s number one economic problem,” as President Franklin Roosevelt declared. It was also a battlefield on which forces for and against social change were starting to form. For a white southern liberal like Jonathan Daniels, editor of the Raleigh News and Observer, it was a fascinating moment to explore. 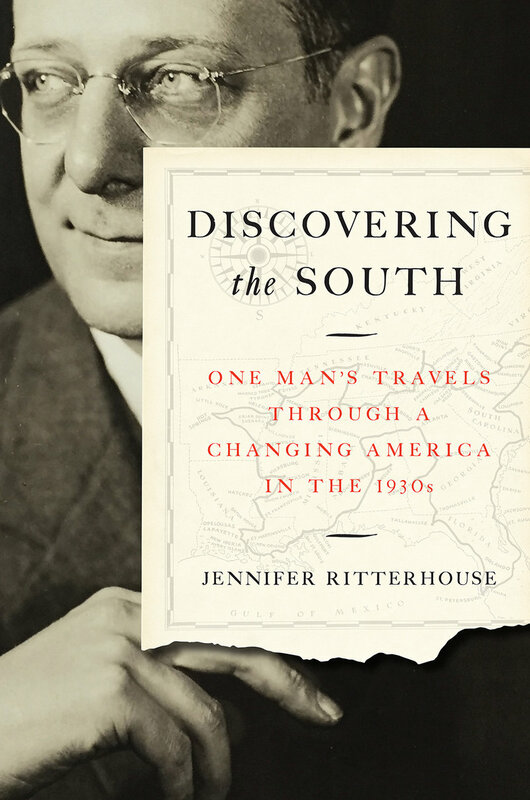 Attuned to culture as well as politics, Daniels knew the true South lay somewhere between Erskine Caldwell’s Tobacco Road and Margaret Mitchell’s Gone with the Wind. On May 5, 1937, he set out to find it, driving thousands of miles in his trusty Plymouth and ultimately interviewing even Mitchell herself. In Discovering the South, historian Jennifer Ritterhouse pieces together Daniels’s unpublished notes from his tour along with his published writings and a wealth of archival evidence to put this one man’s journey through a South in transition into a larger context. Daniels’s well chosen itinerary brought him face to face with the full range of political and cultural possibilities in the South of the 1930s, from New Deal liberalism and social planning in the Tennessee Valley Authority, to Communist agitation in the Scottsboro case, to planters’ and industrialists’ reactionary worldview and repressive violence. The result is a lively narrative of black and white southerners fighting for and against democratic social change at the start of the nation’s long civil rights era. See also the author’s website for the project. 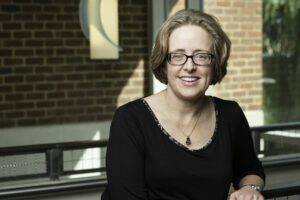 Jennifer Ritterhouse is associate professor of history at George Mason University. She is the author of Growing Up Jim Crow: How Black and White Southern Children Learned Race and several articles; editor of a reprint edition of Sarah Patton Boyle’s autobiography, The Desegregated Heart: A Virginian’s Stand in Time of Transition; and co-editor of Remembering Jim Crow: African Americans Tell About Life in the Segregated South. 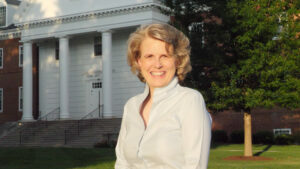 She teaches classes on the 20th-century US, the South, cultural history, and research methods. 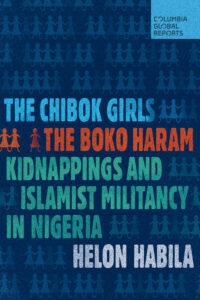 George Mason University’s Associate Professor of Creative Writing Helon Habila offers a compassionate and powerful account of one of the most horrific recent tragedies to occur in Nigeria: the kidnapping of 276 girls from the Chibok Secondary School in April 2014 by Boko Haram, one of the world’s deadliest terrorist group whose name translated into English means “western education is abhorrent.” Habila, a native of Nigeria, traveled to the country twice to track down some of the escaped girls and their families and reconstruct what happened on that fateful day and how the town is coping. He situates the kidnappings within the political and historical context of the rise of Islamist extremism in Nigeria, which is deeply rooted in its tragic history of colonialism. 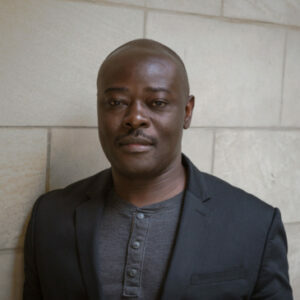 Helon Habila grew up in Nigeria and is the author of three novels, Oil on Water, Measuring Time, and Waiting for an Angel. His fiction, poems and short stories have won the Commonwealth Prize for Best First Novel (Africa Section), the Virginia Library Foundation’s Fiction Award, and the Windham-Campbell Prize. Oil on Water was shortlisted for the Commonwealth Writers Prize, the Orion Book Award, and the PEN/Open Book Award. He is an Associate Professor of Creative Writing at George Mason University.